This is in Beta mode. It’s been tested and works on the Oculus Go. Requires Android API 25. Open the GazePointerWebviewScene and use your head to aim and the controller’s trigger to click. Make sure the browser has pivot points set to (0.5,0.5) so click coordinates translate correctly to the Android’s WebView coordinates. Copy BrowserView.cs and UnityThread.cs to your scripts directory, and unitylibrary-debug.aar(precompiled) to your Plugins/Android/ directory. Fill BrowserView.cs's public fields appropriately. You must set your Android API version to 25 (in player settings). Youtube does not work, see this. The plugin uses WebView.enableSlowWholeDocumentDraw() before inflating the view. 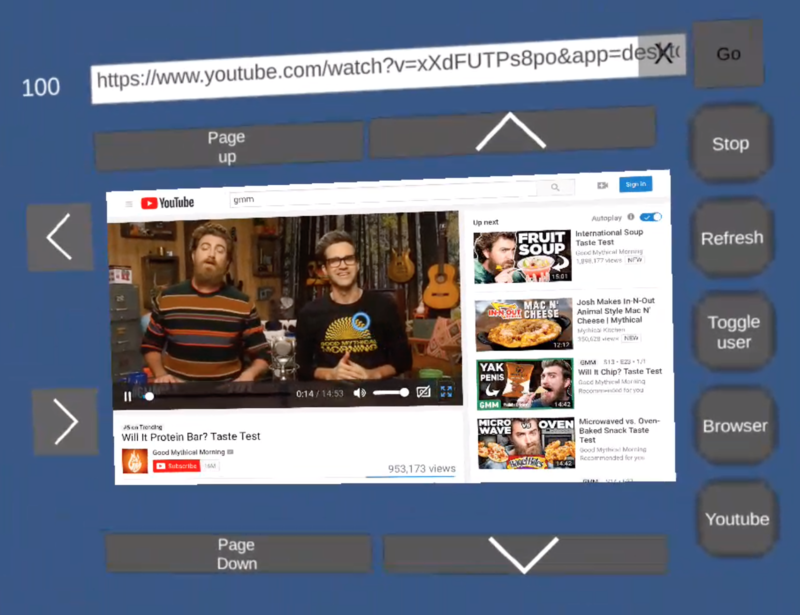 This slows down the loading process for a webpage but it’s the only way I could scroll the view programmatically and still be able to see the webpage beyond the initial dimensions of the screen. Please feel free to improve/fix anything and submit a PR. There’s lots of work to do! The code is in the unitylibrary module. The MainGL class is where most of the work is done, and uses the BitmapWebView’s overrided draw method to get the webpage images.